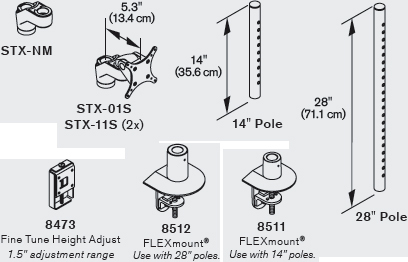 Mount one monitor with Innovative STX-01S Staxx. This single monitor stand can support a monitor weighing up to 30 lbs. Staxx is shown with a 24", 16:9 monitor. Question: I purchased the STX-01S to mount my Samsung CHG90, which weighs 24 lbs (without stand) and is less than 50" in size. I also purchased the 12" extension arm to go with this unit. The monitor, when mounted directly on the base pole, works fine. I was told that the extension arm would work and that it could support the weight. But it wasn’t happening. Moving the center of gravity for the monitor 12 inches laterally was too much for the base, even when clamped to the desk. Answer: As long as the monitor is less than 30 pounds and less than 50” in size, it will work with a STX-01S. Adding an extension arm changes the moment load. In other words the further away from the pole you go the less weight it can bear as the monitor “feels” heavier to the mount. For this product the mount and pole will not fail even at full capacity. 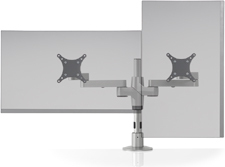 With the 50” monitor at 30 pounds you may experience lean but the unit will not fail with any of the three extension arms shown as accessories on the page. In other words the monitor would feel heavier to the pole causing lean, but the lean would be within spec.